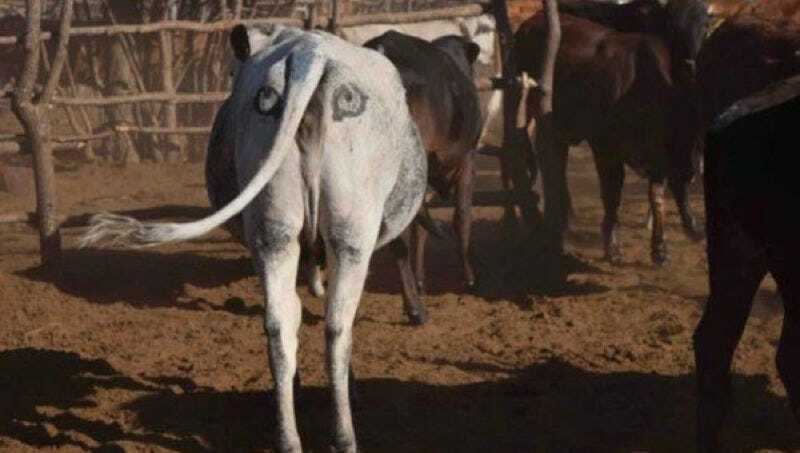 A conservation biologist has come up with a novel method for protecting cattle from being hunted by African lions: paint eyes on their butts. The lions will think their intended prey has seen them and will move on, since they’ve lost the element of surprise. This bit of psychological trickery has been dubbed “iCow” by the man who came up with the idea—Neil Jordan of the University of New South Wales in Australia. It’s actually not as nutty as it sounds. The eye-like patterns on butterfly wings are known to ward off preying birds and, according to Jordan, woodcutters in Indian forests actually wear masks on the backs of their heads when working to discourage hungry tigers. The inspiration for the iCow strategy came while Jordan was based in a village in Botswana, when two lionesses were killed by local farmers in retaliation for preying on their cattle herds. The African lion is a vulnerable species, with numbers dropping from over 100,000 in the 1990s to between 23,000 and 39,000 today, according to the Botswana Predator Conservation Trust (BPCT). Much of that decline is due to these kinds of retaliation killings because farmers have no non-lethal strategies for protecting their herds. “Lions are ambush hunters, so they creep up on their prey, get close, and jump on them unseen,” he said in a statement. When Jordan was watching a lion stalk an impala one day, he noticed the lion gave up the hunt once the impala spotted it. So he joined forces with the BPCT and one of the local farmers on a 10-week trial study, stamping eyes on one-third of a herd of 62 cattle. When the cattle returned each night, they took a head count to see how many had survived. Only three cows were killed by lions during this period—all without the painted eyes on their rumps. And all the painted cows survived. It was such a promising early result that Jordan is now back in Botswana for a more ambitious study, augmented with GPS devices to better monitor the movement of predators and prey. “This will give us information about the exposure of painted and unpainted cows to predation risks, and where the conflict hot spots are,” he said.